I don’t understand Korea. Why it is divided, why we fought a war, what distinguishes it from other Asian countries. 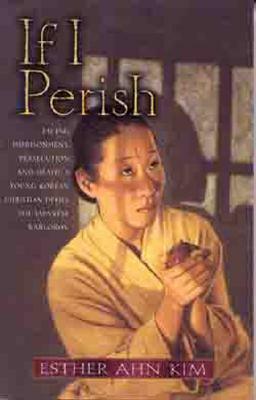 Helpful books are waiting on my shelf; If I Perish , by Esther Ahn Kim (Ahn E. Sook) was the first one I picked up. The setting of the book is Japanese-occupied Korea during World War II. Kim tells the compelling story of her six years of imprisonment for refusing to bow to a shrine. Like holocaust memoirs, it is incredible to fathom what a body and spirit can endure. Her courage is huge, but so is her honesty: she was resolved to die a martyr’s death, but she was horrified at the thought of being cold. She was, in short, perishable. The readiness is all. (Hamlet) After her first escape from prison, Kim found refuge in an abandoned country home. Expecting future imprisonment, she began a systematic preparation for persecution. Did you read that last sentence? She prepared for persecution. She memorized more than one hundred chapters of the Bible and many hymns. She fasted to train her body to live without food and drink: first three days, then seven, then ten. She barely survived the ten day fast. The role of food in her life fascinated me. was, all the food went into my mouth when it was served. What a despicable, ugly person I was. I was upset and sickened at myself. continued for several days, but each day I lost. Then when I was praying, a ray of light touched my spirit. I carried my food quickly to Wha Choon. “This is Jesus’ meal. I have offered it to Him. Ahn’s mother is a great study. She kept the view of eternity on the dashboard of her life. Who wouldn’t desire to be described this way? Esther Ahn Kim’s faith was vibrant, vocal, bold. Amazingly, she lived when many others died. My favorite quote from this book illustrates the active nature of that faith. This entry was posted in Uncategorized and tagged bookreview, korea, memoir, quotes, work by alivingpencil. Bookmark the permalink. Thanks,. Carol. I might add this to my already-too-large list. If not for your review, I never would have considered it. Our 24-year-old nephew leaves for Korea in a few weeks to teach English to Korean children. @godsfarmgirl – You are welcome, my friend! It is a quick read (if that helps you decide to put it on your list). Blessings on your nephew’s endeavors. So often *I* am the recipient of *your* great recommendations. A friend asked me yesterday how I came across My Cry Ascends. “My online friend Janie liked it,” I explained, “so I knew I would too.”Have you seen the documentary Babies? I can’t remember if you use Netflix, but it is available for streaming there. See how we are? One comment leads to more, unrelated subjects. I may have to pick up this book too. We are in contact continually with many of the Korean exchange students who come to our university from the sister school in Korea.